Sam Hickman. Music – Page 3 – Singing Harpist, Cardiff Based. The best thing about having friends with proper jobs is getting to live vicariously through their lives in offices! The people of the great indoors! They don’t have to worry about parking and stairs! They will have to carry some boxes one time and finding it the most challenging thing of their month! They get to sit down all day! They get, and this is my favourite bit, to work with other people, who they do not get on with! Remember the movie ‘Castaway’, where Tom Hanks is trapped on a deserted Island and to keep his sanity has to draw a face on a volley ball and call him ‘Wilson’? Today's tip for musicians: go on holiday during January because there is no point suffering through it. Sure, it looks lovely, but I spend half the day talking loudly to myself, because there is no one else here! I will talk to most strangers on the street because I am so starved of social interaction that anything at this point is great! Siri is my best friend. So, when I get to hear about other people’s lives, how they struggled with Janet in accounting, or how Craig from down the hall keeps humming while he boils the kettle, I am enthralled! Reality television is for audiences who want to live vicariously through people who are in different circumstances and situations that they would maybe never be in. They will never be trapped in a military grade bunker with 14 other people, they will never be super-rich and eat avocados, they may never visit where ever the Jordie Shore is set! (is that even still on?). So people with office jobs is my version of reality TV, and I just lap it up! I love hearing about who’s the new hire! I love hearing about who’s used all the toner in the photocopier! I LOVE hearing about who didn’t wash up the communal mugs when they had a meeting with Robert from corporate! I LOVE IT! I love it in the same way that people love playing violent video games, You love the idea of it but you would HATE to be in that position. Steeling a car? Easy on the telemabox (That’s a totally real gaming console), but steeling a car in real life? That’s illegal and you will get in a lot of trouble for it. So hearing about who Margaret down the hall nearly got fired for spending company gossip, from an exterior perspective: FASCINATING! but if I had to work with Margaret everyday: MY OWN PERSONAL HELLSCAPE! In conclusion, I like hearing about office drama! It sustains me! well….. me and wilson Obviously, we both love hearing about it! Gardening update: Drama, Destruction and Death! I went on holiday and the boy we had staying here watering the plants left four days early! and those four days were the hottest of the year! The wild flower garden we planted before we left is doing incredibly well and Sarah let me dig up a veg patch so I can grow even more fruit and veg! here are some labeled pictures of everything we’re growing! We also have a pear tree now, and my hydrangea is doing brilliantly, as is the rose that we inherited from the previous owners. But the most exciting bit of gardening that I’ve done recently is the gardening that’s not in my garden! At the end of my street is a small space with three squares of ground where trees used to live. and then in 2012 they were removed! and the end of my road became a fly tippers paradise! So when I was offered the chance to take care of a planter on the street I jumped at it! and in June we put a big planter there! So that’s it! Hopefully some lovely things will grow! but you’ll have to tune in next time to see! Doing As Little ‘Work’ As Possible. Like every normal human on the planet, I don’t want to have to work more than I have to. Don’t get me wrong, I love my job and the work I do is really fun, but I don’t want to have to work an excessive amount. In winter, specifically January and February, I have to busk around 3-4 times a week because I have no gigs, so by the time spring and summer comes around I don’t want to have to keep busking when I don’t have to. It makes no sense, why should I schlep my harp out 3 times a week when I’m already making my target amount? The truth is, I don’t have to! which is really nice and honestly I wish everyone could enjoy the freedom of only having to work three days a week, we would get so much done! (There are actual studies to show that a 3-4 day work week would be better for everyone). Anyway, because my working hours are so different from that of someone with a ‘proper job’, I feel like there is a culture clash whenever I talk to someone who’s job doesn’t involve heavy lifting, paranoia about the weather and so on and so forth. I get asked this a lot by people. ‘Busy’ is for people who are trying to do their tax returns, laundry and feed their child while also walking the dog. I am not ‘busy’, I will never describe my work week as ‘hectic’ unless I am lying in an email…. which I occasionally do, I’m not perfect, gang! Because I will never have more than 1 thing to do a day, or in the most extreme circumstances, 4 things to do in one day and then nothing to do for the rest of the week. The idea of calling my work ‘busy’ makes no sense because If I wanted to I could wear my pyjamas for 3 days straight and not leave the house some weeks. So when I’m talking to the woman at my bank or someone asking about my work calling my work ‘busy’ seems like a complete lie… I’m never going to be ‘busy’ if I’m sat here talking to you. I will be ‘busy’ when I have to schedule in conversations. When someone on my staff says something like ‘you have 2 minutes and then you need to be in the car.’ THEN I will say ‘yeah, I’m pretty busy.’ I’m not that busy, I’m not running a country, I have time to spend 15-20 minutes picking out my clothes the night before. I’m not falling asleep trying to finish work and then waking up to get right back to it. I’m not busy. I’m just not. For me, I’m never really gunna be busy, I will be ‘working’, if you work in entertainment, in any form, the best thing you can be doing is ‘working’. Because work is not a constant fixed position, it’s not a desk in an office building somewhere, your work is a performed action. Unlike an office job, you don’t get paid to be sat at a desk (unless you write books or have managed to find a way to get paid for writing a blog… if so, please tell me your secrets!) so when you are being paid to work that is the same as a person with a ‘proper job’ being ‘busy’. For everyone else? Maybe lets just say ‘keepin busy’, I like that because it makes me think of retired octogenarians finding things to fill their time. Which sounds great doesn’t it? Your grandma ‘keepin busy’ is her going to see a castle with her friends, or replanting the hydrangea out in the garden, or going to the proms. It’s less about being constantly working and more about filling time. I will never stop being amazed at people with office jobs who tell me they finished their work and then just did nothing for three hours until the working day was done. What?! If you have nothing to do, either go find something to do or leave! There’s no point in you being there! I think this is why I love my work so much, I am paid for every single little bit of work leading up to the event I play at, If you email me at 11pm on a Sunday and I reply immediately, guess what! That’s what you’re paying for. You want me to learn a piece? You’re paying for it too! If you thought, when you booked me for a wedding that you were only paying for me to turn up, I would be sight-reading your music! I think this model of ‘Time+Work+Anything else=Total Sum’ works better than ‘Time=Money’, because you stop wasting time sat in offices doing nothing and get to go do stuff! Granted this is coming from someone who’s never had and (God willing) will never have an office job. Could you even imagine me in an office for more than 15 minutes?!?!? What would I even do? I have basically no other skills!*. So, let stop asking if people are ‘busy’, because it’s not healthy to encourage that sort of work/life balance, and start asking specifics, or just how they’ve been ‘keepin busy’! You planted a community garden? GREAT! You did some fundraising for your favourite charity? Wonderful! You build your own dinning room table out of drift wood?! Amazing! I want to hear about that! I also want to hear about office drama because I will never have office drama (More on that next month). But, we should be trying to be more than just ‘busy’. *No other high level skills that would make me ask qualified at a desk job as I am at playing the harp and singing. I have skills, don’t worry about that! Reasons Why I Am Wonderful. Last month’s blog post was sad and this one will be happy or whatever. Here’s a list of some reasons when I am wonderful. I’m pretty damn good at playing harp a lot of the time! I’m pretty damn good at singing too! I’m pretty. Damn that’s good. I’m getting really good at playing piano! which is nice! I can make an ok cappuccino! I could probably yodel if I put my mind too it! all the furniture I’ve built is still standing! my office is pretty tidy most of the time. I am alright with a camera! I’m not too bad at recording either! I’m getting more projects in this year! I can afford to do more fun personal passions rather than having to do things specifically for work! I’m pretty happy with the way I look, for the most part. I’m slowly getting better at feeding myself. And That is a small list of things, I’m good/wonderful at. What is Love? Why Can I Never Get to Sleep at Night? and Will I ever lose that weight? Or ‘Questions and Answers’. I don’t really know what I’m talking about this month so I thought instead of writing anything about my job or harps, or gardening or owning a house or any of my other (there are none) hobbies (or which, again, there are none). I thought I would share with you some of the questions I have when I’m lying in bed at night as a scared, frustrated and worried little 24 year old free-lance musician. They are not nice thoughts, so if you want to continue feeling good I suggest you skip this blog and read next month’s entitled ‘How Ole Sammie Got Her Groove Back’ or something. 1) Am I progressing or am I in exactly the same place I started? This one is a tricky one because as a musician, you’re accomplishments are basically completely intangible. You can make recordings and videos etc but the main brunt of your work is simply ‘improving as a musician and performer’ which are not tangible things. If you worked in an office, a clear sign you were doing well would be that your pay would go up and you would also get promotions and move in the company. However, there are so many ups and downs as a Musician (and even just a free-lancer) that it’s actually tricky to tell if you’re doing better or worse. One year you may have a full-time residency, then you lose your residency but still, somehow end up earning more and working less than when you had it! Similarly, you may never do concerts anymore but you may be a lot better at performing than you used to be. So, as long as you are growing and developing, the answer is always ‘yes’. Even if you’ve had no solid work and feel like you’re stuck and never getting out, you’re doing better. 2) Why haven’t I found my audience yet? I genuinely don’t have a good answer to this, I have a condescending mean-spirited answer towards myself, which is always ‘BECAUSE YOU NEVER GET OUT THERE AND DO THINGS?!!?! ?’ but then I remember that I busk like 3 times a week and that’s not really a good enough reason. It takes time… I’m making music not memes! 3) Where did all my money go? 4) I would get more work if I was thin. 5) Will I ever actually just be able to work inside instead of busking? 6) I’m never getting out of here. This is not really about ‘here’ as in a place, this is about ‘here’ as a career. I have very limited prospects. I’m not 100% sure what my next step is, whether I could go into Opera, Musical theatre, or even train formally as a harpist and get into an orchestra (which is apparently all anyone things harpists do…). But, I’m been making a decent living off my Bmus and I have time to decide on a proper career path so I’m not too worried about that. My worry is about my equitment and my actual work. I just want to be able to play on instruments I really like, I absolutely hate my big harp, it’s useless for gigs because it’s so quiet but with ridiculous string tension that gives you absolutely nothing in return… So my second worry is that I will be stuck playing this instrument for years until I can finally get something that works for me. 7) Do I hate my job? yes… maybe… who knows… sometimes… doesn’t everyone… why do I never smile when I’m playing events…I should smile more and pretend I’m having fun at work. 8) Will I ever be respected enough at work? I am so sick of children running into my harp at weddings, and middle-aged women thinking I’m some sort of charity case that needs to be ‘helped out’. Does my talent not speak for itself, and if it does, then is THIS what it’s saying about me? 9) When will I be famous enough that people will never ask me to work for free? 10) Why don’t I have more friends? I feel like whenever I’m with people it’s just a performance… I don’t like having to make conversation and it’s exhausting trying to think of clever, funny and insightful things to say. I just wanna sit in my office alone and only communicate via email. 11) Why don’t I have more friends who are musicians? 12) Will I ever find my ‘crowd’? I’m still looking for the group of 20-40 year old free-lancers who all hang out together and go to fun and fascinating events and cultural gatherings together. Where are those people? 14) I spoke to about 3 people who all knew who I was this week and I have no idea who they are….. What’s wrong with me that I can’t remember faces or names? honestly, maybe this is just practice in case you get super famous and everyone knows who you are…? I guess… *Shrugs* OR, you are a terrible person, you need to put more effort in when you meet other people, it’s no wonder you’re a sad loner. 15) Why Did I let that woman take all the chairs from my table? I went to a concert yesterday and they had tables so I sat down expecting someone to come sit one the table too as it was a pretty good view and a woman came up to me and asked if she could take a chair. Next thing I know I’m sitting alone at a table in a crowded room.. This is a large 4 person table with me on the only chair… Why did I not say ‘oh, you’re gunna take all the chairs and make me look like an anti-social loner who masterminded some insane plan so that they wouldn’t have to sit next to anyone else at this crowded concert… ok great, thanks.’ I don’t know, it just felt selfish and exclusionary to take a bunch of chairs instead of just sitting at the table… I’m complaining about nothing here, let’s move on. 16) Do I hate everyone? Seriously though, is hating everyone just a trait in my personality? I get that I’m competitive by nature and I would probably win a hunger-games style event due to that alone. But, why don’t I like a lot of people? I’m so judgemental and mean all the time… it’s no wonder I don’t have any friends. 17) Do people understand me? 18) Should I get an office? No… I’m not that busy. 19) What If I’m never busy enough to need an office?! 20) If I close my eyes and lie really still, why can’t I get to sleep? Seriously, I just lay there for hours in complete silence waiting for dawn to break half the time. 21) Am I too angry? 22) Am I not angry enough? 23) Do I sound good or do people just pay me because they feel sorry for me? no joke, I genuinely had a theory that my parents for paying for the Hilton to have me for my residency. I don’t want to know if it’s true or not, but it’s a solid theory! 24) Do I really want this? Is this really what makes me happy or have I just made it so that getting a different job would be awful? 25) What do I want to do? 26) Why don’t I travel more? 27) Where am I going? 28) How am I gunna get where I’m going if I have no idea where that is? 29) What do I need? A couple weeks ago I took part in a waste of time. It was called ‘Classical revolution’ and it took place at one of my favourite Coffee shops, ‘Little Man Coffee’. Looking at their social media and their videos it looked pretty good, it looked like there was a good number of other musicians coming together to do little concerts and perform works they hadn’t yet played for an audience. So naturally I said I would do a couple pieces, because I am slowly trying to get back to some good classical repertoire. However, when I got there one sunny afternoon, it became apparent that I was the only person performing at this concert that I wasn’t being paid for… the organiser was half an hour late as well. This organiser was the definition of ‘Mediocre white Man’. He started talking to me after I had done a 30 minute set and I assumed he was just a random member of the public coming to tell me how much he enjoyed it… he was the organiser…. we had not brought his instrument, he had effectively missed his own concert, and he mumbled. The Mumbling is what got to me. Here I was, a confident and professional musician, hosting my own concert, by myself, not being paid for it, and I wasn’t even in charge! This mediocre man then told me that he would say something after my ending set… I was amused by this, did my final 10 minutes and starting packing up while this man mumbled to a now almost empty coffee house… like, most people had gotten up and left when I’d finished my first set. A couple weeks later I performed at Pontypridd museum… I organised everything, I did all the promotional work, all the flyers. And people actually came, people also watched on the live stream, which was great. But people came! and they even donated! So, we actually made a small profit! So, after this I became more frustrated with the fact that I had organised a successful solo concert and managed to get people to turn up for it, and yet this man had managed to organise a monthly concert series…. soooo… Now I’m doing one. Because…. If I’m not being paid, I might as well be in charge! It’s true though, if I’m not going to make any money from doing this guy’s concert then I might as well be in charge of my own concert. Anyway, so the first one is 7th June, 1pm. We’ll be live streaming it too! Don’t worry! but also, we’ll be doing it every month (if it’s successful!!!!) with different artists and performers each month who will all get to share their wonderful talents with you! So! You can come see it live! watch it online! and follow it on twitter!!!!! also tell a friend! and please come! Please!!!! Sam Hickman – Back At IT AGAIN!!!! Here’s a non-harp post so show the range and variety in my life…yeah…? yeah. so, when we last left our garden it looked like this! Since then the weather’s gotten a lot warmer and out lovely little garden looks like this! Planty got a new pot! The old rose that was here when we bought the house is going to bloom this year! I assume for the first time in a very long time, and we don’t know what colour it’s going to be!!! so that’s the main excitement! Other than that, our herbs are doing well and we should get some pees, blueberries, raspberries (depending on how quickly it grows) and who knows what else we’ll plant. Another great gardeny project I’m in charge of is putting planters in my area, full of herbs and things people can pick and take home! which is a fun idea! I’ll probably do a post about that when it comes as it’s quite exciting! ooh! also, we had a bbq!!!!! Remember that weekend when it was really lovely weather? A very pinterest thing I saw was to put lanterns along your garden to create a little bit of light as the sun goes down. It combines my two favourite things, Lanterns and gardening. It’s fundamentally useless and doesn’t really do anything, if you wanna see your garden path at night, get some lights. But if you wanna feel like a fancy lady of leisure as you drunkenly stagger to your bathroom after too much rosé, get some lanterns!!! Also, you can use the hooks for bird feeders and bird baths as I do, so that it’s not only decorative but also good for the birds! This is not a harpy/musical post… this is about my garden! I know! change and variation is what you come here for! I actually managed to take some photos for before and afters! but we’re still mid-progress so I’ll do another post in July-ish to see my garden in full glory! This is what it looked like, but there was a tomato plant that was riding the struggle bus all the way through august. And loads! (and I mean LOADS!) of beanpoles EVERYWHERE! for some reason they were everywhere! So when we moved I dug up all my plants, put them in my car and drove over. So I chopped up my roses, fuchsia, lavender, raspberry and blackberry and brought them over. And surprisingly, most of them survived! My Rose in early march looks a little happy and my fuchsia is gradually coming back. Sadly my lavender died a death! it didn’t survive the move as well as the rest of the gang! So this week I had to buy a new one for that spot. With the second flower bed I trained the rose, which is very old and is growning very healthily, which is great! and we planted some herbs, flowers, another lavender and hopefully some peas will grown for a tasty spring treat! In the middle of my garden is ‘planty’ a young elder tree Sarah picked up for free from last year’s eisteddfod. Now he’s grown up nice and big! Finally I planted out some bulbs to give some early spring colours! Can’t wait for spring either way! So what projects are left for the garden? So in the coming spring, I’m hoping to gravel over the uneven payment of the patio, we think a shed used to live there and then they just ripped it up and left all the uneven concrete. 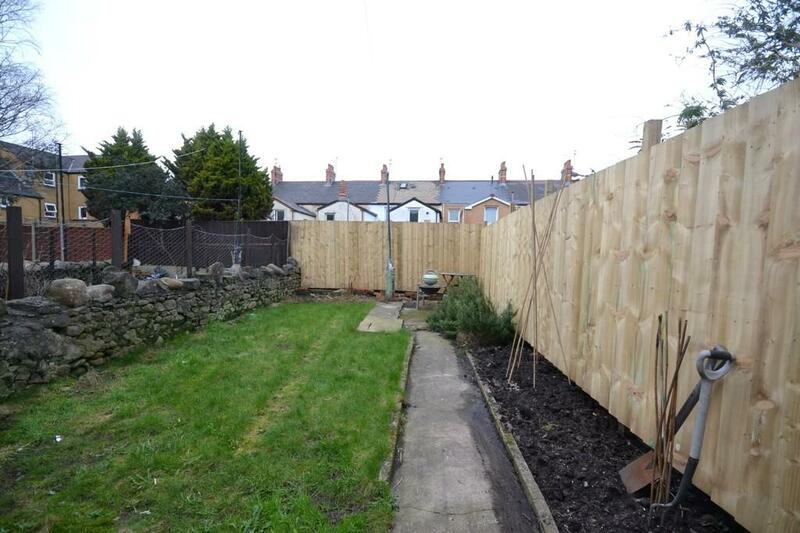 The second project is to put up a screen where the beanpoles have been set up to give a more secluded seating area. So, when I’m sat eating my lunch I’m not staring directly into my neighbours kitchen and then straight into my other neighbours garden. So, I’m going to put some fence posts in and then a trellis across and grow some evergreen climbers to make a little screen that doesn’t block out any light on the second flower bed but still makes the patio seem cosy and secluded. This is in leu of putting up a big fence on the wall because that would deeply upset my neighbour and ruin the lovely relationship I have with them. The third project, which will probably happen next year is to build a corner pergola for my roses to climb up and over, but this is a big project that might need a lot of work. Anyway, that’s my garden, late march! looking forward to spring! Talking to Strangers. Making Wild Assumptions About The Woman Busking With A Harp. Busking. Talking to Strangers. Being Mansplained to. Getting Gigs. I felt like I had to write this today because I had two very strange interactions with members of the public while busking today, and it’s not rare that I get people asking me questions or coming up to talk to me and I think it’s great that people are curious about my instrument and my work and want to know more! that’s great! what isn’t so great is having to deal with all the nonsense people feel they have to tell me. Normally, if someone wants to talk to me for a gig, or about my harp and my work, they will wait for the end of a song or if they are in a rush apologise for having to interrupt while they grab a card (tip for buskers: leave your cards out so people can help themselves! You’ll be surprised how many people take one!). These interactions are usually quick, lasting up to 2 minutes, and both parties walk away from it with a clear and productive attitude. ‘How many Strings is that?’, ‘Is that a welsh harp?’, ‘Do you Do Weddings? !’ all of these are classic Frequently Asked Questions, and I’ve memorised a pretty comprehensive spiel for each one. I like getting asked these questions because they show that people see my work as work and as a performance, not as anything else. Just a woman with her harp and a song in her heart! Less impressive questions sometimes arise ‘Are you A Student?’, ‘Are you at Royal Welsh?’ I’ve just started lying and nodding because at this point stopping to explain ‘Well I graduated around 3 years ago, I was the resident harpist at the Hilton Cardiff for two years and I’m still and currently working as a free-lance musician, this is my real job, thanks!’ is too long and just opens up more questions for people. I’ve just started smiling and nodding whenever people say things to me because, quite frankly, if someone has something good and important to say to me they will make sure I hear it… otherwise they will shout it from 5 metres away…. you get the response you deserve. During my time I’ve had a lot of great interactions with people who love music and just want to tell me how much they enjoyed my playing… this is not about them. This is about the people who do not see what I’m doing as a legitimate musical expression in an unlikely venue… These are the people who think all singers are born from X Factor and all talent is found on Britain’s Got minimal Talent. Making snap judgements about people is not an exact science but I think in my case it’s a very valid form of retaliation. For example, the first incident happened when I was just setting up, I had my harp out, my sign, my stool and my amp and I was getting ready to sit down and tune. This elderly couple had be standing in front of me since I’d gotten my harp out, watching and so as I sat down I said ‘Oh! I haven’t tuned yet sorry!’ and the “gentleman” replied with ‘Do you speak english.’……. I was taken back for a moment and said ‘well what do you think I just spoke to you?’ and followed it up with ‘What kind of a question is that? of course I speak english I started speaking to you!’ It wasn’t a ‘Are you welsh?’ or a ‘siarad Cymraeg?’, which are both very good questions to someone playing the harp in the welsh capital… It was ‘Do you speak english?’ in an odd tone that had odd assumptions attached. But it’s not the first time that sort of question has ever come up. I have a fairly interesting accent and back story, coming from London to Texas to London to Wales is pretty interesting if you also sing and play harp! The unfamiliar accent juxtaposed with the harp promotes this question a lot, almost on a weekly basis. I think half of it is people just being curious creatures, which by design, we are! But I also feel like they should just say ‘Oh! you aren’t from around here’, and just cut through all the nonsense and get to whatever they want to get out of asking a question. I think it’s better to ask that than say ‘Oh where in America are you from?’ because if you ask that question I will lie to you and say ‘Oh no I’m Canadian’ because I like to play games too. This happened at the supermarket last week and I simply replied ‘No. I’m not’ and all polite conversation stopped. My new lie-response is going to be ‘No! I’ve immigrated and I’ve come to steel your jobs!!!! MOOO HA HA HA HA!!!! !’ Because, again, I like to play games too. Anyway, this gentleman asked this question and I responded and once we had gotten passed whatever point his first question had, he told me the most tedious story about how his second-cousin’s sister’s wife’s dog’s grandmothers’ uncle’s niece rent’s out larger harps than the harp I was playing. To which I replied ‘well… good for you…’ BECAUSE I DON’T CARE!!!! Unless you have something genuinely interesting or cool to say like ‘I worked with Deborah Hensen-Conant’ or ‘would you like a bunch of money to do this gig in two weeks’, I don’t really care…. We’re in South Wales, everyone has seen, played, touched or looked at a harp. You don’t need to tell me about it, it won’t go anywhere. Similarly, I hate it when I bring up that I’m a harpist and someone tells me about a harpist they had at their wedding. I will immediately ask you how much that person charged. Because that is the only useful part of your boring story! Also, it’ll never lead anywhere! If I have to have a 5 minute conversation with you and you start with ‘oh I like the harp, my sister had a harpist at her wedding’ There is NO WHERE to go from there! NO WHERE!!!! You’ve basically set it up that I have to talk about your sister’s wedding harpist, which is not an interesting topic of conversation because, guess what, You can’t remember any of the details about it!!!! If you bring up a topic with a stranger, you better know more than ‘I was physically there and there was this’ because otherwise there is no conversation to be had! But enough about me getting annoyed at networking events and people having boring things to say to me. Today, I got mansplained to… about my own work… from a man who had seen me before. This man came up to me and said ‘Oh I’ve seen you before, in the hayes, you’re very good’. I said ‘Thank you’ like a normal person. He continued ‘Do you have any CD’s’ I replied ‘No, I’m all out sorry’, he said ‘Oh I would’ve given you more money if you had CD’s on you’, which is understandable… duh of course you would I am giving you a CD… He continued ‘You know, you should get on Wizz.com’… ‘they let you share your music and people will give you money for it’, I replied ‘Oh like Itunes, Amazon Music, Spotify and my online store on my website ‘CardiffWeddingharpist.com’ ?’ (I gestured to my sign with all my social media things on it). He continued for around 2 minutes on this website that is basically bandcamp… he added ‘They will also help you set up a website’… ‘I have a website…’ I again, gestured to my damn sign! I replied ‘No, I earn a really decent amount’. ‘Yeah, but you could be making more’. By This time I was playing so loudly that he was having to shout. Because when someone starts talking to me for too long and are just wasting my time I do what the Oscars does and ‘Play them off’, start quiet so they think ‘Oh they are just noodling away’ and then at the 3 minute mark, slowly crescendo until the point where you can’t hear them and they have to shout over your harp to be heard. Usually they get that you want to get back to work because there is not going to be any tangible outcome of this interaction and you’d rather be working than having to have a pointless conversation. In his closing 2 minute remarks, he reiterated his belief that I am a poor struggling girl in massive debit (which… honestly… what?.. GIANT LEAPS from this guy), reprised his nonsense about this site that would cure cancer or whatever he thought it does. And then finally left. HE DIDN’T GIVE ME A PENNY!!!!!!!!!!! He took 5 minutes from me and didn’t give me a damn penny! I’m pissed about it even two weeks later! So, there you have it, two strange interactions with strangers making weird assumptions about a nice middle-class white lady playing harp in the street…. honestly, I have more questions about this but I know they will never be answered. These sorts of interactions are very rare thankfully, and I know this is me coming with privilege to complain about something so minimal when there are real issues in the world! But I had to put out a blog post this month and NOTHING INTERESTING HAS HAPPENED TO ME!!!!!! So this is me whining for 1800 words! (sorry). I love having good interactions and conversations with strangers on the street. I like when people come up to me with cool projects or interesting events they would like me to get involved with! Love it! But sometimes I just want to sit down and do my work… I think I’m at the point where busking is just another day at the office. I enjoy the work and I am thankful for it everyday, but it’s not a crime to want more and better. Be clear and to the point please. Just because I didn’t come out to talk to you I came to play my little awkward songs and make some money and get some giiiiigs!